Affected mobile phones: Samsung S5, J7, J7 Prime, Note 4, LG G4, Motorola Moto G3, Moto X Play, OnePlus One, Lenovo, K6 Power, Gionee S6, Nexus 6. Affected mobile apps: WhatsApp, Facebook, Sharing mobile apps & UI. Affected OS: Mostly Android Marshmallow & Nougat. Here we are quickly going to discuss; What is "Screen Overlay Detected" error in Android? Why does the user keep getting 'Screen overlay detected' whenever he tries to give new app permission? How to turn off screen overlay in Android? If you are confused about the stability of your android device & thinking about why this issue will be occurring again and again, and you have no idea how to overcome this problem? Then follow these easy steps to explain the 'screen overlay detected' error on Android. The screen overlay detected causing turn off to allow permissions to use all resources from your Android phone. Then, you unable to set application permissions due to "screen overlay detected." The Android popup saying "Screen Overlay Detected" message shown on the display screen if the user is trying to grant permission and the Android system quickly alerts you that a screen overlay has been detected. Let's see what is this "Screen overlay detected" notification? And how to solve frustrating Android error "Screen Overlay Detected" as quick as possible. As because many Android users with updated OS getting the overlay error continuously, today we are coming with the possible solutions to kill this error and we assured that you would be completely satisfied after following this quick guide. This error occurred whenever you're running a floating app in the systems, and in the background, your overlay is continuously running. And if you start a newly installed app, which requests to access rights, the Android OS will not provide you the permissions to be changed when an overlay is running; thus the OS shows the message presenting a "Screen Overlay Detected" error. I saw there are so many suggestions and are mostly misleading where they described that 'Factory Reset' is the best solution for this error. By one angle that could be a possible solution. Resetting all the setting is easy, but it restores all the app info to its defaults. So it's not a proper way to get rid of this Android error. So, a better way we just want to find accordingly which gives you a better fix this overlay error. So, without wasting any time lets check out the quick but proper solutions for this error "Screen Overlay Detected." Check whether you are not installed the apps like 'Clean Master,' 'Twilight,' 'File Manager,' 'Drupe,' 'Lux' & 'CM.' If you are previously installed any one of this application then first, you need to uninstall it. Also, you required removing any screen dimmer app. Now search the name of apps and remove those as listed above. After completing this all steps "Restart" your Android device. And you are done. Check the error has gone now. As you see in recently launched smartphones, it gives you quick options including "One-Handed Operation." You want to disable it before you are going to install any new applications. Go to "Settings" >> "Display and Wallpaper" >> "One-handed operation"
You will see "Side key panel" click it >> OFF it by pressing the Green colored symbol on the right side of the top. That’s it! This method also solves the error. The third technique makes you a little bit annoying, but you have to do it to solve overlay detection error. When you get the one pop-up window "Screen Overlay Detected" as well as the option name as "OPEN SETTINGS," click on that. Now you can see all the applications which are installed on your device earlier. Now TURN OFF all step-by-step making a problem. When you complete this action, go for the back. 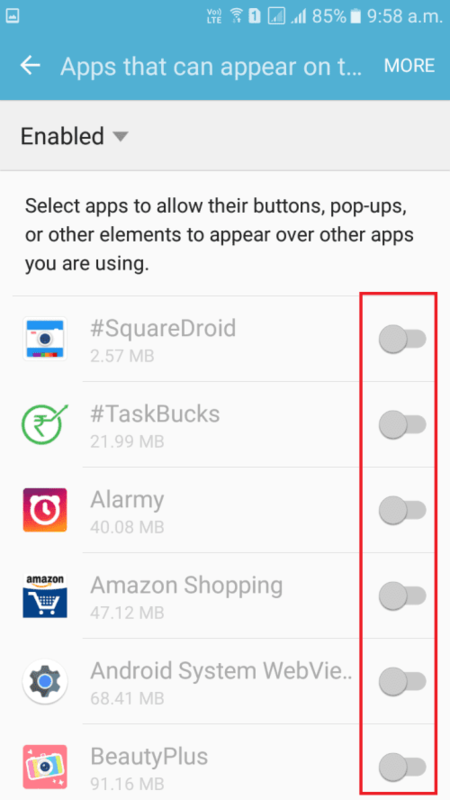 You are getting another pop-up came with the "NOT NOW" & "APP SETTINGS." Just tap on "APP SETTINGS" and go back again and you are done. Go to "Settings" >> "Applications" or "Application Manager." Now in the list, tap on "Apps that can appear on top"
I hope these simple techniques are pretty enough for you to get rid of "Screen Overlay Detected." Now onwards, you will not get disturbed in the future. If you have any issue about Android OS then feel free to ask & don't forget to share it via comment section shown below, we love you find the solutions and solve each Android error personally.